Right Ho! 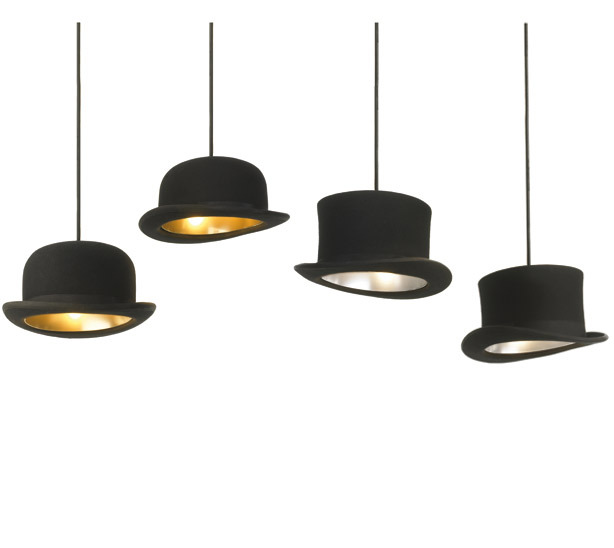 When browsing through some inspiring new designs from the Milan Design Week, I was excited to see these elegant pendant lamps by British designer Jake Phipps, in the form of either a bowler or a top hat, and aptly named Jeeves and Wooster! Why do they appeal to me so much? Well, I am a hobby milliner (the word is derived from Milan, where the craft originated); one of my favourite British authors is P.G. Wodehouse (main characters in his delightful novels are Jeeves and Wooster); and my style is eclectic traditional; so who could they appeal to more! Choosing to sell your home is definitely a life-changing decision, one that many people make only once or twice in their lifetime. It can be one of the most exhausting, stressful, and costly decisions you will ever make. If you haven’t been in the market to buy a home for a long time, you may not have the experience fresh in your mind, plus buyer’s expectations have certainly increased. When you last did a home search, do you remember what was important to you? What really impressed you, or really turned you off? Did you really like one of the homes you saw, but you just couldn’t get past that one really irritating thing? I would like to walk you through an imaginary home that is listed for sale, through the eyes of a potential buyer. Certainly this is not a complete list of the possible obstacles to a successful sale, but they are some of the most common ones that a buyer will encounter. My goal here is to help you to understand how quickly a potential buyer can become so overwhelmed with all the little things that if they encounter a bigger obstacle, that will be the last straw. So, if you think buyers won’t worry about the little things, or that ‘they’re going to make the home their own anyway’ after they buy, it may be time to take off the rose-coloured glasses, and see your home from another point of view. You have some pretty stiff competition this year! Hard to see the house for all the overgrown trees and shrubs. They must not care very much about the property – looks like they haven’t weeded or mowed in quite a while. It’s now April and they still haven’t raked and swept up all the leaves from November? I hope they take those Christmas lights with them, we don’t want to take them down and we certainly don’t want them! What is all this stuff piled at the side of the house – looks like old lumber, and is that an old fridge? I don’t have the time or the means to take all that stuff to the dump. There sure is a lot of dirt accumulated on this siding – I wonder if they plan to clean it before they leave. This doormat is so dirty, they must always be tracking dirt into the home, I bet it’s pretty bad in there. I’m really trying to avoid buying plastic – it really annoys me to see all these unnecessary plastic lawn ornaments. I see from this display that they follow the _____ faith. I don’t agree with their doctrine. The door is very dirty – do you think those marks will wash off, or will we have to paint this door? I would normally take off my shoes, but the floors don’t look clean – I think I’ll leave my shoes on. It was wet outside though and they don’t have a mat inside to wipe my feet. The coat closet looks pretty stuffed – it’s probably not big enough for our coats either then. I’m feeling so overwhelmed by that awful paint colour, I have to move through here quickly – I’m feeling claustrophobic. I guess we would have to clean the carpet on these stairs, or maybe they should just be replaced – we don’t need that extra expense or work right away! It’s so dark in here – I would get depressed without more light. I smell something – they must have pets in the house, I have allergies. I hope it’s not a dog, I’m very frightened of dogs! It’s hard now to even think about the house – is that dog in here somewhere? Oh, the thought of putting my food in that dirty fridge is not pleasant. That dripping tap is so annoying – that fixture must be really old, I bet it needs replacing. This kitchen is so outdated, we would have to replace just about everything. If they’d only just replaced this beat-up old countertop, perhaps we could have lived with this kitchen for a while. There’s the dog’s dishes – pets in the kitchen, that’s not sanitary. There’s so much stuff laying around – I guess there’s not enough storage in this kitchen. I don’t like anything on my counters – this definitely won’t work. I don’t know if I could ever forget that this kitchen was dirty – I won’t put my things in here. Oh my, that wallpaper is definitely not my taste! I don’t want the mess of removing it. I remember this wild linoleum from the 80’s – one more thing we’ll have to replace! It’s so dark in here – maybe there isn’t enough windows. Their belongings are so crammed into this space – I doubt we’ll be able to fit our things in here either. This paint colour won’t match my sofa, we’ll have to paint this room too! Those curtains are not my taste – I definitely couldn’t live with them. Why do they have their office desk in here? There probably isn’t enough room elsewhere in this house. I’d like to see what’s outside that window, but there’s no way I can get close enough – there’s so much stuff on the floor. That fireplace is so full of soot – I don’t think I’d want to maintain that all the time. This carpet is so soiled, I doubt if we could get it clean – we’ll probably have to replace it. This dining room table and chairs barely fit in here – I bet ours won’t fit either. More of this awful wallpaper – another project to add to our list! The window is a good size, but it’s so dirty I can barely see outside – I guess we’ll have to clean all the windows too. The closet doesn’t look big enough – look how crammed it is – my things couldn’t possibly fit in there. More soiled carpets – we’ll have to clean or replace these too. This door doesn’t shut properly – I like my privacy. These wallpaper borders everywhere sure won’t work for me – I’ll have to remove them – more mess! This room feels really cramped – I’m feeling very claustrophobic in here. I really don’t like this colour of paint – it’s so loud – I like a calming atmosphere to sleep in. There’s mould around this window – there must be moisture issues in here. The grout around the tub is dirty and mouldy – this is unhealthy and will have to be repaired. The fixtures in here are so old – we’ll need to update these. You think they could have cleaned that toilet better – is that a stain, or will that dirt come off? There must be issues with their water here – there’s mineral buildup on everything. There’s a lot of stuff laying around in here too – obviously not enough storage – where will I put everything? I spend a lot of time in the bathroom – I don’t think I would be comfortable in here. We have 2 vehicles and they say this is a 2-car garage – it’s hard to tell right now. There’s so much stuff in here – I wonder if they’ll be getting rid of it all – and what kind of mess is underneath? I sure don’t want to deal with this. As you can see, when a buyer is moving through an unmaintained home, the list of to-dos can quickly become overwhelming, and chances are they will not remember the viewing as a positive experience. The truth of the matter is, when people are buying a home in today’s competitive market, they don’t have to accept the hassle or expense of bringing a home up to their standards – they want a move-in-ready home and there are lots of them. Sure, in time they will want to make the home their own, but they need to feel that they can comfortably live in the home immediately. Your home should appeal to a broad range of buyers, so you want to keep everything as neutral as possible. Equally important though is that your home is in good repair, clutter free, neat as a pin, and white-glove clean! If you’re having difficulty identifying the problem areas in your home and you could use the trained objective eye of a professional, a ReDesign Stager can do a walk-through of your home and provide you with a recommendation report. You can then choose to either DIY or engage the services of the Stager to assist you in preparing your home for sale. Not addressing the problem areas of a home could mean that a listing could sit for months longer than necessary – eventually necessitating a price reduction, which would cost you a lot more than you bargained for! 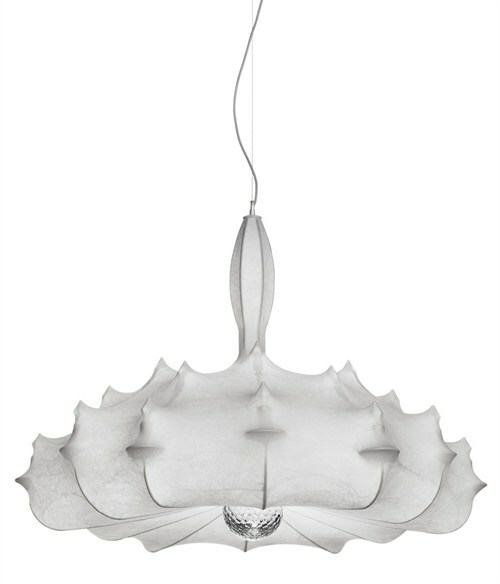 Available through Inform Interiors in Gastown, Vancouver, BC. 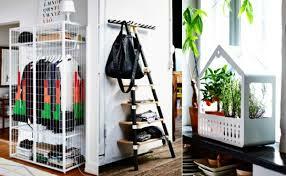 Ikea has just launched a new line of space-saving products – the Ikea PS 2014 Collection – ‘On The Move’. The products were designed primarily for the needs of young urban generations who are frequently moving and require mobile designs that make the best use of small spaces. Another consideration was for products that were free-standing, due to many rental contracts which prohibit permanent attachments. This is a very affordable line of products and many are well suited to post-secondary students or young children but, as you will see, these products have a broad range of uses that span most demographics, including commercial and institutional applications. Available April 1st. Well, it is winter, but even so this collection from Moncler seems particularly ‘dark’ in more than one sense! 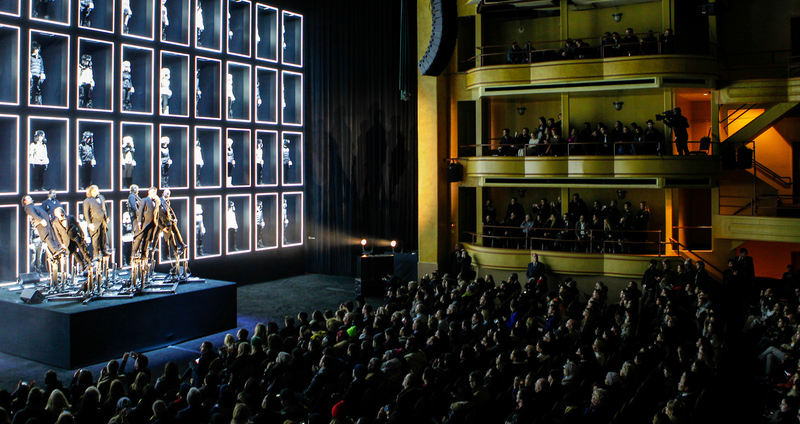 Certainly though, the stage debut of the collection is characteristically creative and unexpected and is sure to hold the audience’s attention. The models are lurking in the shadows and, from a distance, they’re quite militaristic looking, at first giving you the impression that these fashions are made for the battlefield. Upon closer inspection however, the pieces are made instead to battle the elements in style; perhaps with climate change upon us, this collection forebodes of challenging times ahead. 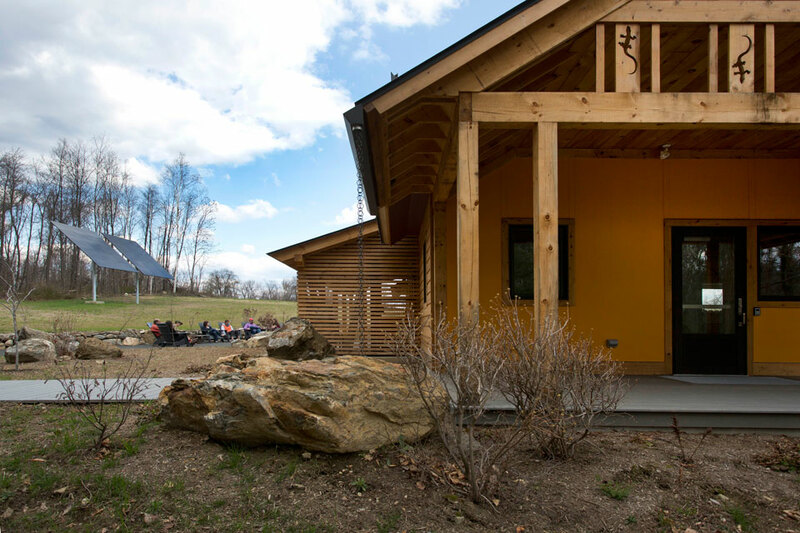 http://living-future.org/case-study/bechtelenvironmentalclassroom / Note – tribute, by way of wood engravings on the building, is made to the Jefferson Salamander – an endangered species whose plight will be helped by Bechtel’s purchase of the land. Aging in Place – Is Your Home Ready? We are hearing a lot lately about Universal Design. With so many baby boomers choosing to ‘Age in Place’, or age at home, instead of a senior’s residence, it is becoming increasingly important that our homes be adapted to accommodate our aging bodies. As we age there are many factors which need to be considered to keep our homes safe and user-friendly. Changes in our vision, hearing, balance/stability, strength, and mobility are some of the things that will inevitably change, and our homes will need to be designed accordingly. Use of the design is easy to understand. The design communicates necessary information effectively to the user. The design minimizes hazards and the adverse consequences of accidental or unintentional actions. The design can be used efficiently and comfortably. Appropriate size and space is provided for approach and use. With some thoughtful planning, Aging in Place can be a possible and very positive choice!